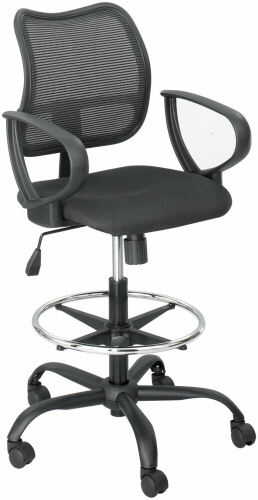 Click the button below to add the Safco Vue Drafting Chair [3395BL] to your wish list. With this extremely comfortable ergonomically designed mesh back drafting chair from Safco, you'll actually enjoy working. Perhaps that's going a little overboard, but this is an extremely comfortable chair. It features a contoured foam padded seat and screen mesh backrest with lumbar curve for support and ventilation. The seat is stain resistant and the seat height is adjustable. You can also adjust the tilt and swivel 360 degrees for complete flexibility while working. This mesh drafting chair is sleek looking and heavy duty, with a rugged nylon base and dual wheel carpet casters.